Show Racism the Red Card attended the GMB National Conference in Plymouth from Sunday 4th June to Tuesday 6th June. Our stall was well received by delegates who took away thousands of our club posters and bought a total of 90 T-shirts. 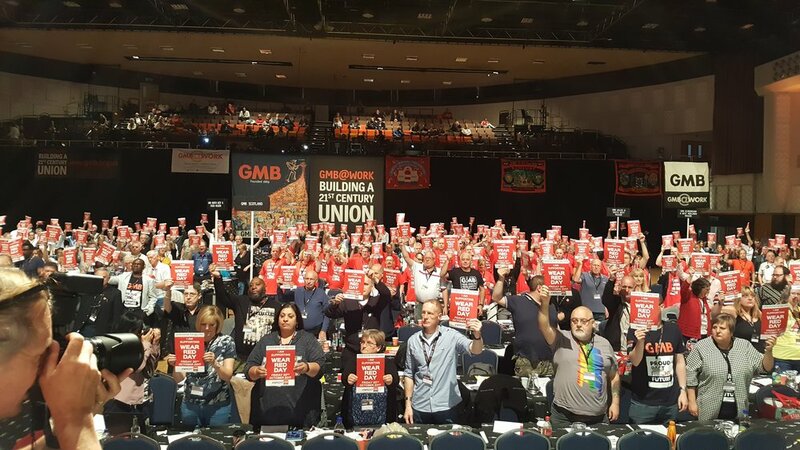 Tim Roache, General Secretary of GMB, moved a motion of support for the campaign’s Wear Red Day (October 20th 2017) and delegates held up our cards in solidarity. See pictures. Thanks to Gary Smith and GMB Scotland who helped us set up our stall and to Taranjit Chana and GMB BAME members for their support. GMB Race stands in solidarity with the work carried out by Show Racism the Red Card, in tackling racism through enabling role models to present an anti-racist message to young people and others by changing hearts and minds and saying Stop the hate. In the current climate the training & campaigns by SRTC enables people to be able to have those difficult conversations with skills, tools, & knowledge to challenge racism, islamophobia, homophobia & transphobia.